Lounge poolside or show off your dive skills – the choice is yours. Stop by for a cookie, they’re freshly baked every day! Enjoy some me-time on your private balcony while the sun goes down – you deserve it. Kitchenettes give you options: make your own food or eat out and save the rest for later. 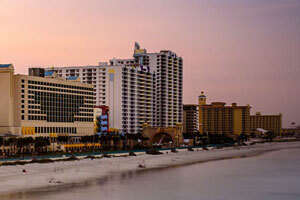 The resort is located right on Daytona Beach. You only have to drive 10 mins to enjoy the restaurants and bars on the Daytona Beach Boardwalk. Check out the new racetrack at the Daytona International Speedway, only a 13 min drive from the resort. Bahama House is just two miles from Main Street Daytona Beach, far enough away to have a peaceful vacation, but close enough to enjoy all of the excitement that Daytona has to offer. When you arrive in the recently renovated lobby try a cookie – freshly baked daily – while you’re getting checked in. Stop by your condo to drop off your luggage before heading to the outdoor pool. Don’t worry about unpacking; there will be plenty of time for that later. Change into swimsuits, grab pool toys and water wings and slather everyone with SPF. Grab a lounge chair and get comfortable, you’re going to be here for a while. The resort hosts a nightly Happy Hour that can’t be beaten. Complimentary cocktails and snacks - what more do you want? They even have popcorn for the kids! As if that's not enough, there’s a complimentary breakfast buffet in the Grand Bahama Room with everything you need to get your day off to the right start. No wonder the resort was awarded a 2016 Certificate of Excellence from TripAdvisor. Studio condos sleep up to four guests. Kitchenettes have full-size refrigerators with enough room for everyone’s favorites plus the leftover pizza and pasta you had delivered from nearby Fratelli’s Pizzeria (you are on vacation!) and a microwave because not everyone likes cold pizza. The freezer is perfect for your ice cream stash. Now the only question is – Ben & Jerry’s or Häagen-Dazs? While you’re enjoying your ice cream, catch the big game or a Friends rerun on the Flatscreen TV with premium channels. Just in case the kids get chocolate somewhere other than their face, the on-site laundry facility will come in handy. Need more space? Upgrade to the Large Studio. For over 75 years, Main Street Daytona Beach has been the home of the world’s largest motorcycle event, known as Bike Week. This festival takes place every March and lasts ten days. Or check out the smaller festival, Biketoberfest. It lasts four days and takes place in – you guessed it! – October. Ocean Walk Shoppes features a variety of shopping and dining options. Browse the selection of well-known brands of sunglasses at Sunglass Hut. Maui Nix Surf Shop has apparel, accessories and footwear for women, men and children. Escape the Florida heat for a few hours and catch a flick at the Paragon Theater. After the movie, grab dinner at one of the many restaurants before heading back to the resort.